Kelpie and Rannoch are currently in a foster home in the North of England and are looking for a permanent home preferably together if possible. Here are some details. 1. Kelpie â€“ neutered female â€“ born Dec 07 â€“ about 23 inches â€“ looks like miniature Deerhound in lots of ways but we were told originally she was Deerhound/Greyhound/Beardie/Bedlington! However she is not laid back at all and is a busy little dog. Has slept in the house in a crate or in the kennel. We find she eats more food than you would think for her size. Obedient and good off lead â€“ has not been worked but looks for rabbits in the fields. Has been fed a good quality, mainly raw diet of meat, veg and fruit. Likes raw chicken wings and backs and bones but will eat anything and here she occasionally has Wellbeloved. Does not guard bones or food. Good in the car. Microchipped. Needs a home where she will have lots of time spent with her, loves being trained. 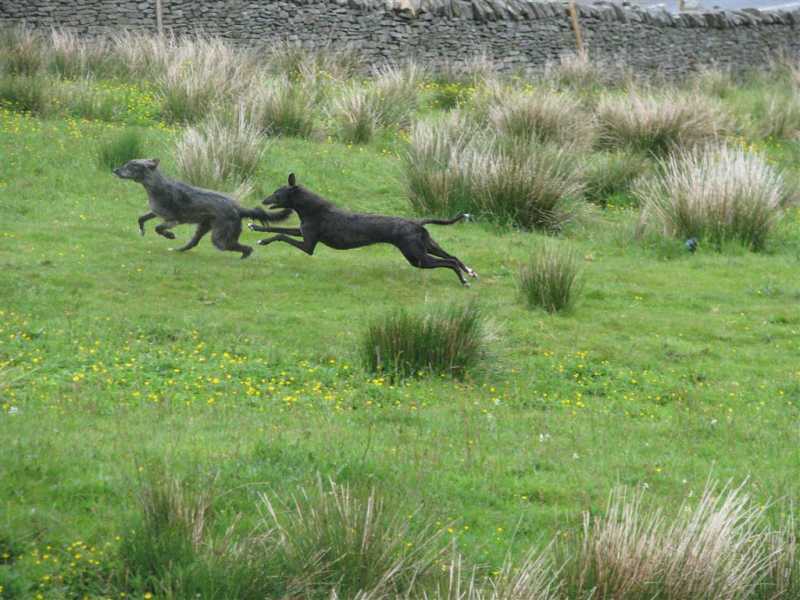 Loves racing round the field with Rannoch with whom she has lived for a long time. 2. Rannoch â€“ entire male â€“ has lived with Kelpie, partly kennelled and partly loose in the house â€“ they have both had lots of outdoor freedom and been with someone most of the time. He is Deerhound/greyhound (we also have his paperwork). He was born July 07. Again very friendly and obedient, no sign of male aggression, good off lead and in the car â€“ about 26 inches tall. Again not worked but sniffs about in the field looking for things. More laid back than Kelpie. Fed the same as Kelpie. Microchipped. There aren't any cats at the foster home so do not know what they would be like but they look keenly at the ferrets there. They both seem healthy and have been wormed with Drontal Plus. Inoculation status is not known. 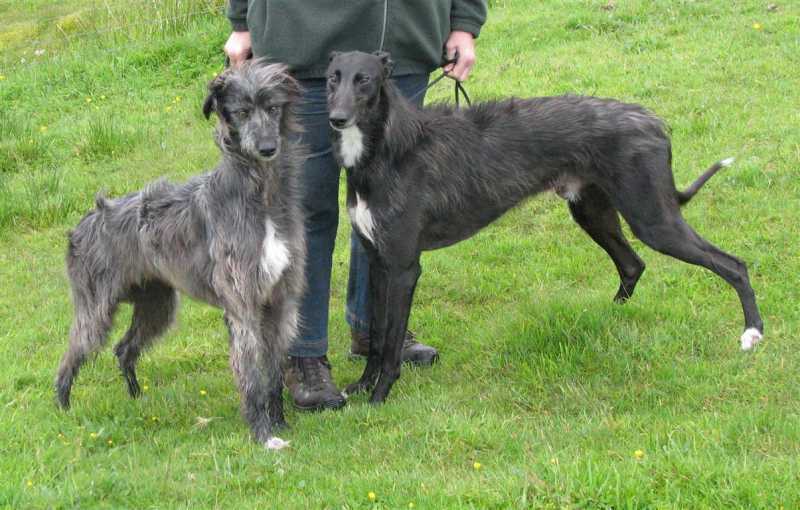 I hope you have found a new owner for this very nice Lurchers. Any updates for us on this nice pair?